Advantage to the home team. New Hampshire athletes garnered a victory at both ends of the annual Border Battle with its Bay State neighbors at Alvirne High School in Hudson, NH. The Granite State contingent copped the varsity girls meet, finishing with an impressive nine points to their rival's 24, while the boys result played out similarly; a 10 point margin in their favor. Groton-Dunstable captured the girls' team crown with Coe Brown in close proximity while Con-Val edged up for third. On the boys' side of the ledger, Concord High School once again showcased its dynamic lineup in collecting the top slot. Second went to Coe Brown and Massachusetts entry Marshfield rounded out the top three squads. "We were hoping the result would play out as it did," said Crusaders head coach Colleen Naboicheck. "They're an excellent team. Today we were able to get three of our runners at the top 20 and stack the remainder close by, it certainly worked out well for us." Senior Emily Willson paced Groton Dunstable, finishing sixth in 20:17.60. She was followed across the line by Sarah Maple, who was 13th overall in 20:45.54. Completing the scoring for Groton-Dunstable was Sydney Adams (17th, 20:57.97), Meagan O'Dell (29th, 21:32.58) and Allie Demers (32nd, 21:43.76). Individually, Coe's Evan Tanguay hit the tape in a leading 16:23.11 for the win in the boys' race and Milford senior Rebecca Durham extracted herself from the bunch in the latter portions of the circuit in taking a 15-second win (19:07.50) for the girls. "This is a positive test," said Concord head coach Tristan Black Ingersoll of his team's quality showing. "We feel that we should be tired and not necessarily be primed up for the meet and still be able to win the meet, and that's what happened today. Actually, a lot of the guys were disappointed that they didn't run faster, but that's good in a way because it shows that they are thinking about the bigger picture." Marshfield had four of its runners finish in top 20. Sophomore Nick Valianti led the Rams by placing fifth overall in 16:52.92. Senior teammate Chris Bunker was sixth with a time of 16:55.05. Senior Joe Joyce (11th, 17:09.17), senior Mike Maglio (18th, 17:26.01) and senior Cam Hassing (57th, 18:43.94) rounded out the scoring. 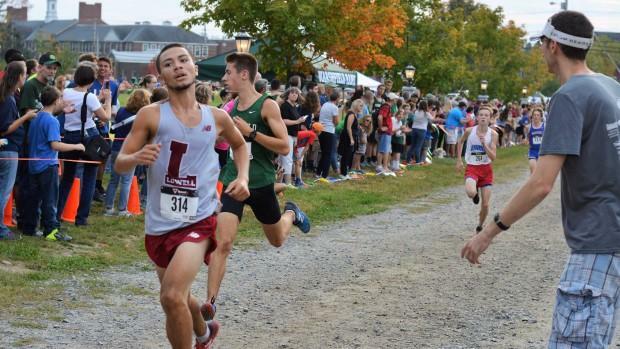 Lowell, which was sixth among the 18 schools, was led by Daven Rosa, who was 17th at 17:25.45.